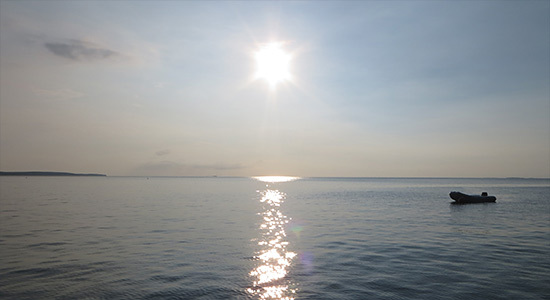 A Blissful Afternoon With True "Sea Pros,"
Update 2019: Sea Pro is no longer operational. 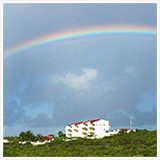 "What is the #1 thing I should do on an Anguilla vacation?" After "what is your favorite beach?" and "what is your favorite restaurant?" that is the third question I get asked most often. The answer is simple. 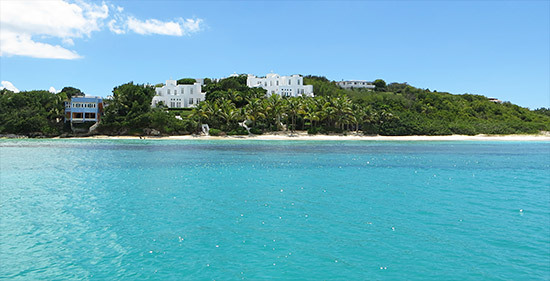 Anguilla is known as "Tranquility Wrapped in Blue." 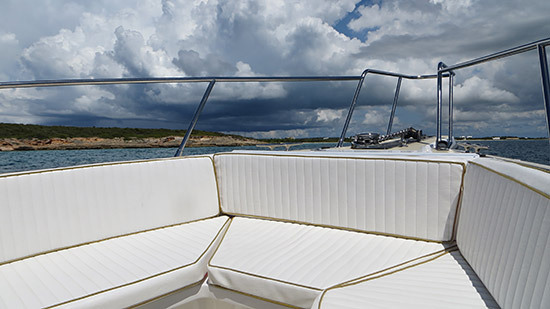 No experience captures that truth more distinctly than an afternoon on the water. 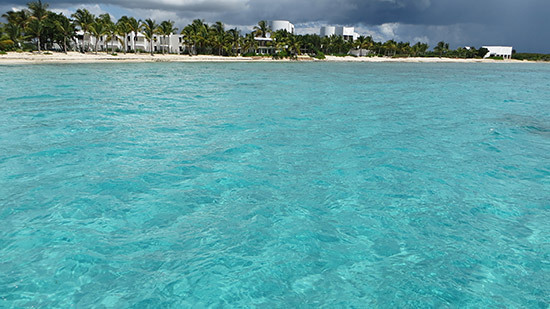 Turquoise and clear straight to the bottom, every time we're gliding across Anguilla's seas there is a moment when everyone goes quiet. The silence breaks when someone inevitably says, "Isn't it amazing that we get to live here?" The color and clarity just takes your breath away! 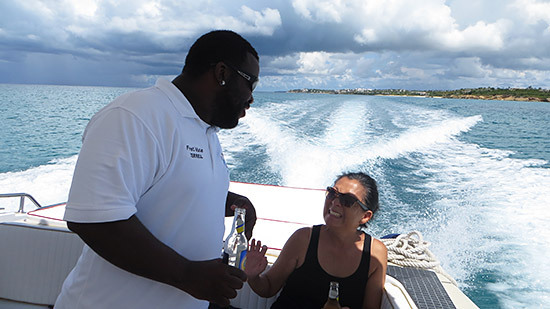 With warm and friendly hosts at your side, Anguilla's famous rum punch flowing, exotic, hidden beaches in the distance, taking a boat charter is really a must-do. "Sea Pro Charters, Sea Pro Charters, Sea Pro Charters." This name kept coming up in conversation with local friends and friends vacationing on the island. 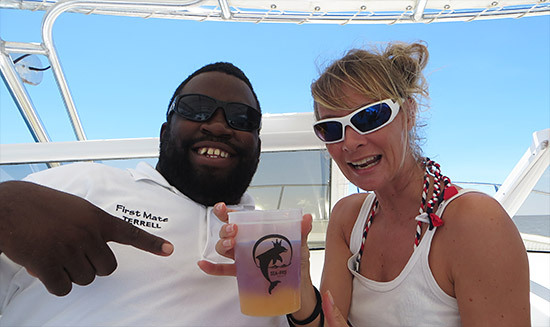 There has been so much chatter about this charter and the duo behind the boat, Captain Wayne Richardson and First Mate Terrell Hughes, I had to find out what the buzz was about. So, we arranged for a Sunday afternoon outing with close friends. "Sure thing," Wayne said excitedly, "meet us in Sandy Ground and we'll be good to go!" Note: If you're staying on the water (i.e. 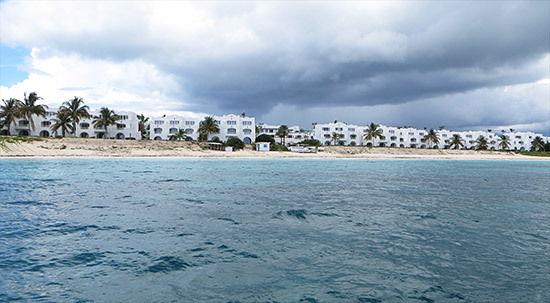 at CuisinArt, Cap Juluca, Viceroy), they can pick you up there, depending on the weather. We approached the glistening white boat that was waiting at the water's edge. Right on the sand, boarding was smooth and easy. Terrell, the First Mate, greeted us warmly, smiling from ear to ear. Inside, Captain Wayne was waiting for us. He settled us in and explained all of the safety features. Then, he outlined an itinerary for the day. Last thing? Drinks all around. Wayne got the boat ready for take off and Terrell handled the beers. With dark clouds looming over Sandy Ground, we were ready to head for the brighter skies beyond. Wayne and Terrell are two of the most generous, genuine and good humored guys I have met. They are dedicated to making sure everyone's safe, happy and having a good time. 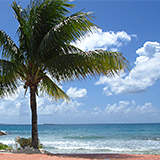 Eager to talk about life in Anguilla, life overseas, and life in general, they are interesting and knowledgeable. Throughout the day they're having a good time, too! Their enthusiasm is real. 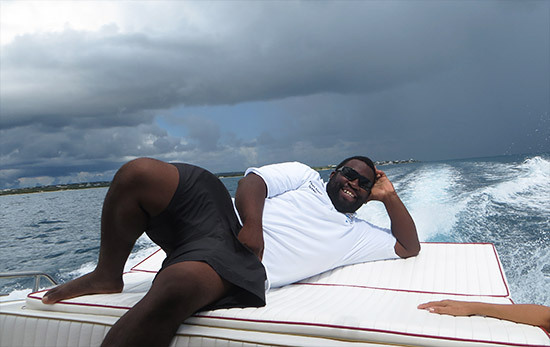 Wayne and Terrell have been operating boat charters for decades. 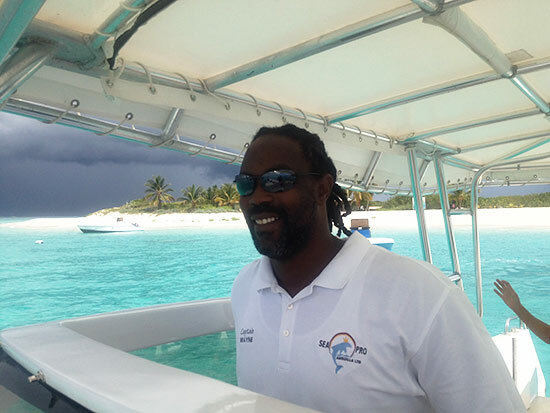 Wayne worked for 20 years and Terrell worked for 15 years at the high-end Cap Juluca, one of the top resorts in the world. 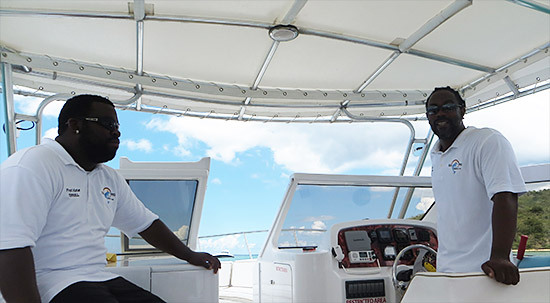 They operated Cap Juluca's luxury charters, going above and beyond for guests with the highest of expectations. 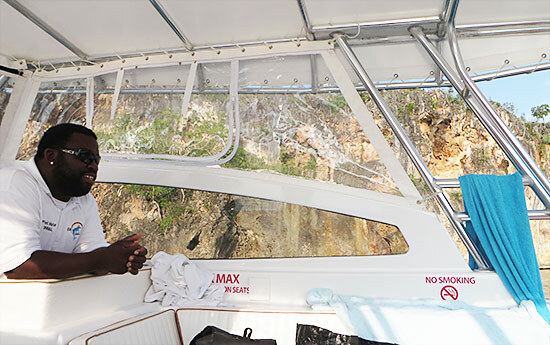 From picking guests up in St. Maarten and bringing them safely to Anguilla, to delivering five-star days at Anguilla's cays, everyone who stayed at Cap Juluca fell in love with Wayne and Terrell. They are true pros (sea pros)! 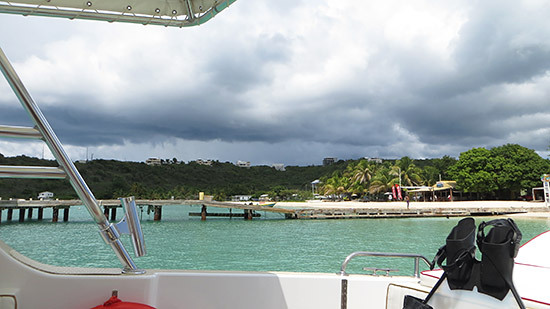 Given the weather and the clouds, Captain Wayne planned a route to keep us in the sunshine. First, we'd head west out of Sandy Ground and explore the island's north west shore. Then, we'd round the western tip and cruise along the south west coast. After that? To the cays! 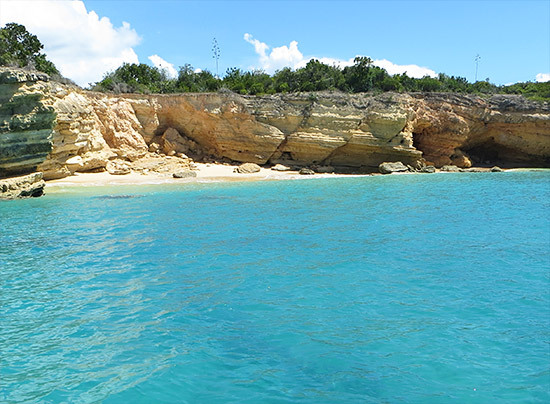 Anguilla's coastline is striking. We were blessed with a particularly glassy day. The seas were so still, transparent and blue, you swear you could bottle the ocean up, put it in a cocktail glass and it would go down smooth and sweet. 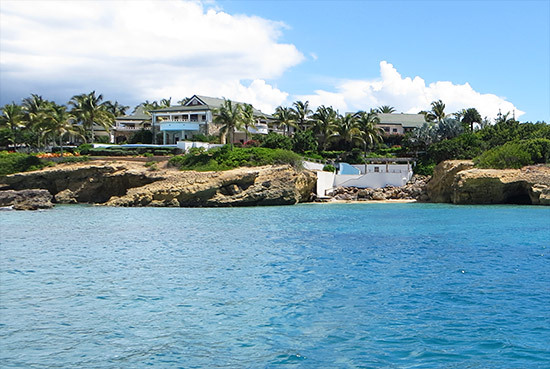 The north shore is marked with high cliffs, hidden beaches, big popular beaches and some of the most luxurious private homes and villas. Terrell was our tour guide, naming different sights and pointing out various changes in the rocks and beaches. He knows his shoreline! 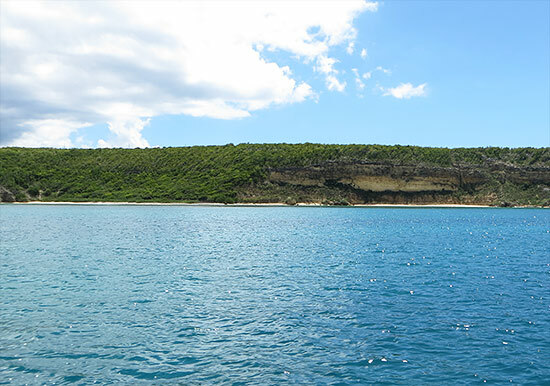 Long Bay, though not a beach we frequent often, is a true gem. The blue water in front of the beach is especially pure. 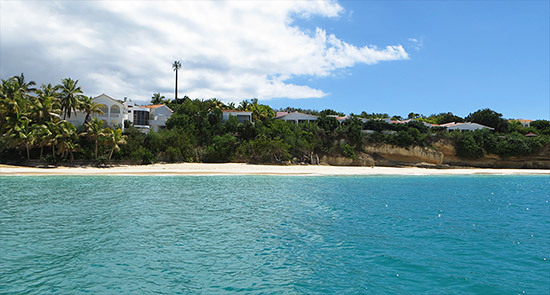 As if Long Bay isn't special enough, as you round the corner to Meads Bay there is an idyllic little spit of sand that's only accessible by boat or by the staircase on Malliouhana's property. This "secret beach" is called Turtle's Cove. Isn't it magical? I could be shipwrecked forever! 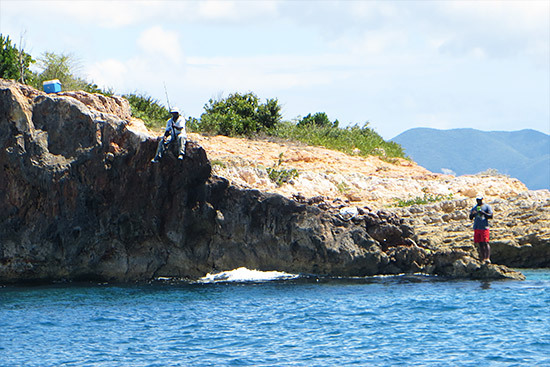 On such a calm Sunday, the conditions were perfect for spearfishing and snorkeling. 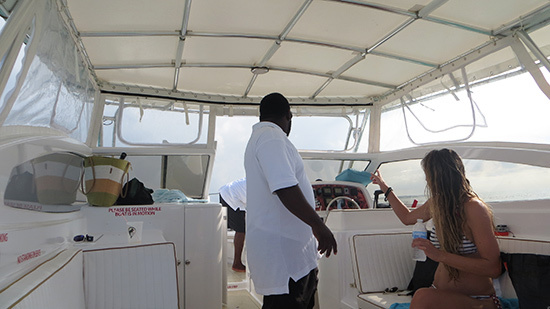 Captain Wayne took great care and kept an eye on the sea, giving the spear fishers a wide berth. Meads Bay was especially tranquil and inviting. At its western tip is the impressive Viceroy. Doesn't this look like a set on Hawaii 5-0? Just as remarkable, at the other end of Barnes Bay, is this enormous private home. Terrell told us it's being sold for $32 million. In addition to tennis courts and pools, it even has its own "private" little beach! Forget the pools and tennis courts, I'd be happy just with that golden sand. As you come out to the far western northern shore, the coastline becomes more dramatic. 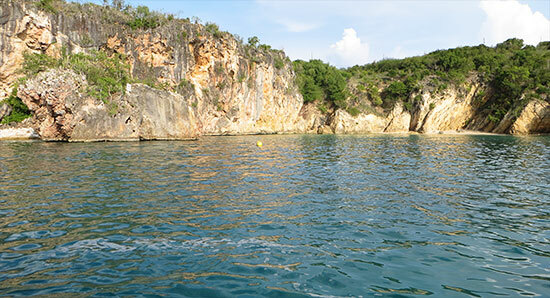 The cliffs are high and surround the most romantic coves, and the water is so calm and clear. We've walked those high cliffs. I remember being tempted to just dive right off the edge. The water is just so inviting. Docking a boat here for a whole afternoon wouldn't be a bad idea. With so much to see though, we pressed on! 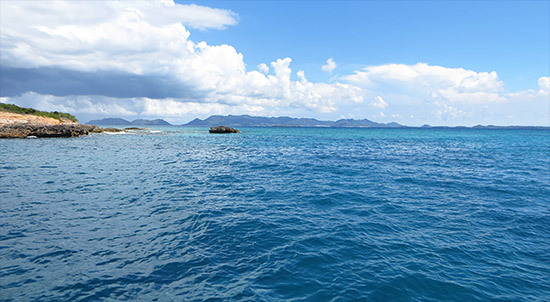 Right as you reach Anguillita, a little island off of Anguilla's western tip, St. Martin appears, dreamy in the distance. 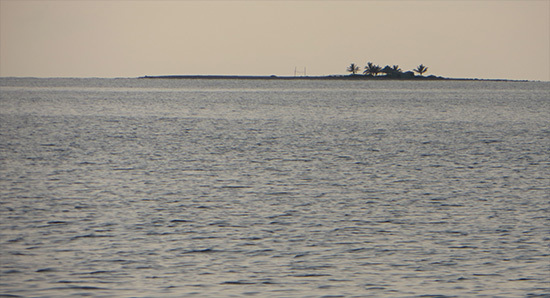 Right at that point too, the very western point, there were a few fishermen enjoying the Sunday and the calm seas. Terrell told us that days like that, when the weather is so still, make for the best fishing days. Along the way, Terrell kept us well "hydrated." Quick to offer another drink, they are very generous with their beverages. Heineken, Carib, white wine, red wine, juice, water? Take your pick! They have rum punch AND a blender on board too for mixing a variety of cocktails. We decided to save those drinks for Prickly Pear. 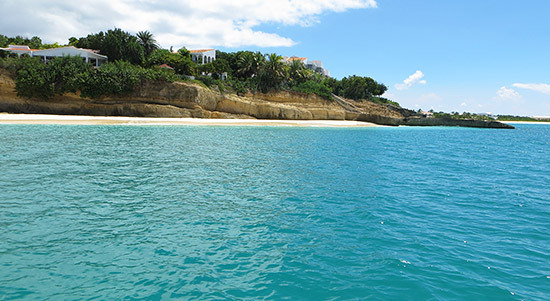 The south west side of Anguilla is much more developed than its northern part. 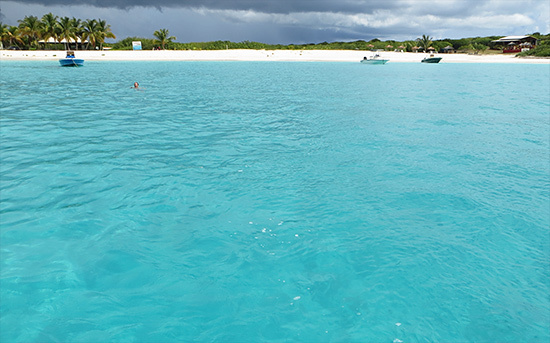 This is the Caribbean Sea side, the waters are especially turquoise, and the views of St. Martin are impressive. So, it's no wonder why! Cove Bay, Merrywing Bay, all the way until we saw this famous sight... CuisinArt! 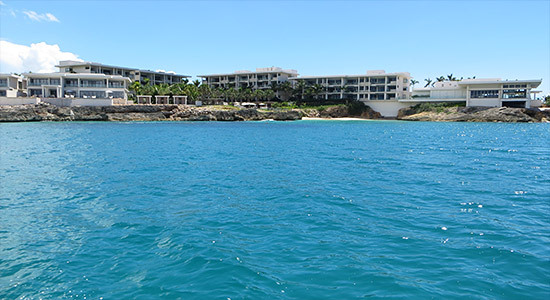 We rounded Rendezvous' eastern edge and went up to Anguilla's International Yacht Club. It was time to circle back. The clouds were closing in. With Captain Wayne leading the way, he was determined to keep us ahead of the storm. To the sun! 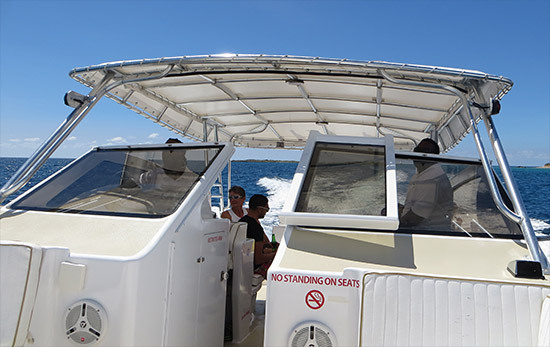 With two huge engines on the back, you know this boat has speed and power. Still though, Captain Wayne is not in a rush to "get you there" and hurry you along past all of the sights. He really takes his time. As we skimmed across the sea, I got a good feel for the boat. 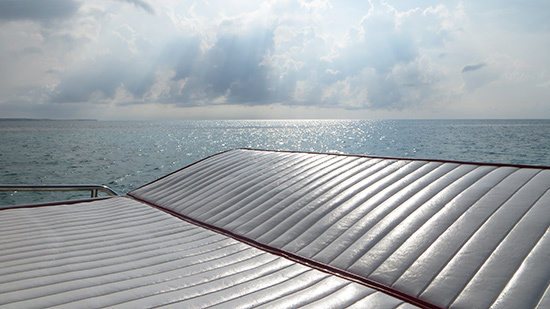 One of our friends pointed out that he loved the wide shade the boat offered. You will not fry to a crisp here. At 20', there's plenty of cushy seating space. Whether you want to be up in front or in back, you really don't feel overcrowded. For more wind in your hair, sit up front. For a little more protection from the elements, relax in the back. On top of that, they have shields that they can put up to protect you from the rain. They put them up when a little squall passed over us as we approached Prickly Pear. They are prepared for everything and anything. Seating, safety, space... it's all great. But, my two favorite aspects to this boat? The music and sound system. Get ready for this... the Wi-Fi! YES, I was able to check email, Instagram, Facebook, Twitter, even Skype with my sister in New York City for a bit, and I could hook my iPhone up to the sound system (via their Bluetooth technology). To be able to be on a remote outer beach and still be connected to the rest of the world is pretty cool. Prickly Pear never fails to wow me. Perhaps the approach has something to do with it. 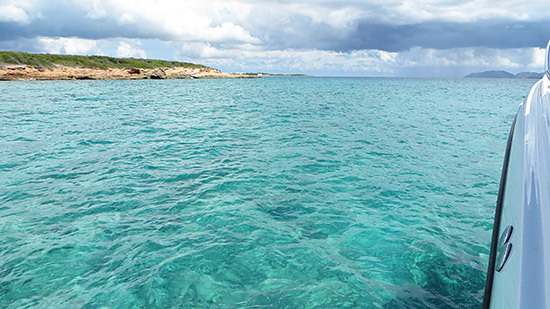 You enter Prickly Pear in a small channel that runs between two scrubby islands. 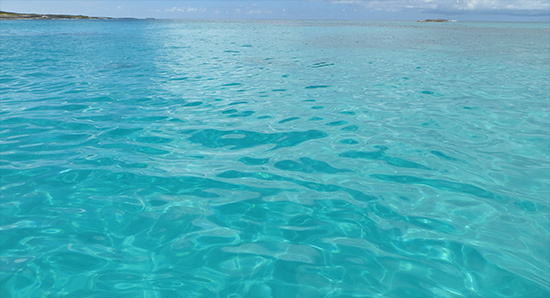 Out of the channel, turn right, and you're greeted with the clearest, calmest blue waters you have ever seen. Beyond the tranquil bay, big waves crash on outer reefs. The contrast is remarkable. 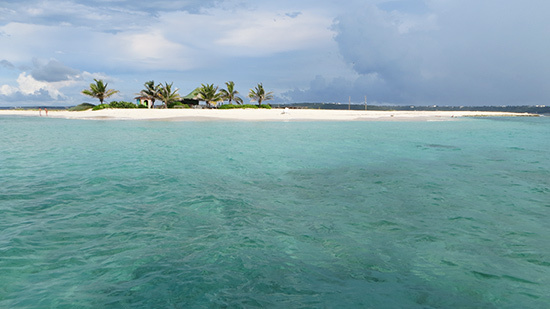 A small beach graces the shore of the southern island that makes up the cay. On shore, there are two little beachy restaurants. Otherwise, it's all nature. 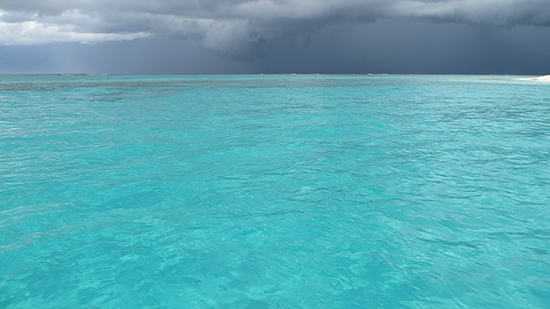 As we lingered in the sea, a small storm approached to the south. We watched lightening break way off in the distance. Thunder cracked shortly after. We were in the clear, watching the show from miles away. Terrell offered us some of their sea toys. I've seen these in serious dive videos and in various movies, but never had the chance to actually use one. Grab onto it and it propels you through the ocean. 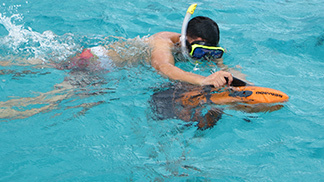 Powered by a battery, it keeps you from getting tired on long snorkels. My Mom can't swim. Not only can she not swim, she hates going in the water. She doesn't like dipping into the pool or the ocean with me, my sister or my Dad. She gets nervous. Once the nerves set in, it's pure panic mode. That changed on our day out with Sea Pro Charters. She never looks this happy pre-swimming normally! Somehow, Terrell and Wayne made her feel totally at ease, instilling confidence in her ability to paddle around without drowning. With a floatie strapped around her tummy, she was all set. "I'm not worried, so you shouldn't be," Wayne said calmly and happily. This resonated with her. So, she descended, holding onto the stair case. She leaned back and finally let go. I couldn't believe she really did it! 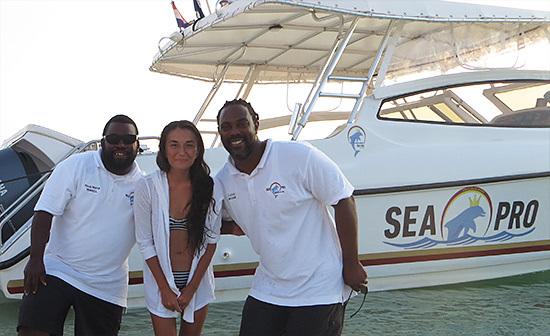 Sea Pro Charters is her favorite for that very reason. 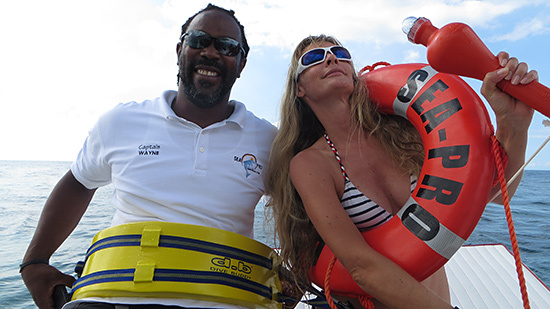 Terrell and Wayne have a particularly soothing effect, making her feel so calm and relaxed in the sea, removing any unreasonable fear. By that measure alone, the day was a huge success. Sweet, without being sickly sweet. Rummy, without being overly alcoholy. It was blended to perfection and topped off with shaved nutmeg. There was no issues of pouring or spilling either. They have their rum punch conveniently hooked up to a bar type hose that they clean out regularly. Its name? Mercy rum punch. 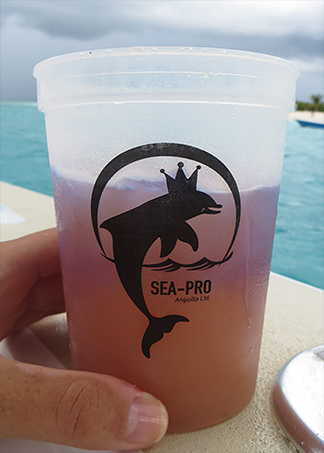 They serve the rum punch in these darling Sea Pro cups. We were all pretty taken by them. They light up different colors depending on the temperature of the beverage inside. These cups are yours to take home, too. Speaking of Sea Pro branding, they have everything Sea Pro. From super absorbant towels, to t-shirts, to lip balm, to sunscreen, they have it all and it's all Sea Pro! A speck of sand sand just off of Sandy Ground, this island is loved by many. When we pulled up there was a light rainbow welcoming us. The storm was behind us now. We dropped anchor and swam to shore. 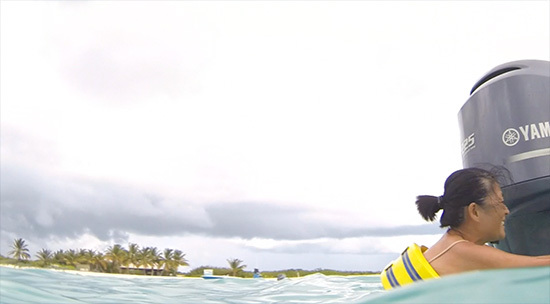 Can you believe that even my Mom made it to shore with her floatie? Across a wide stretch of open water, I was impressed she would venture so far from the boat. The island was all ours that day, not another soul in sight. We walked from tip to tip, marveling at having this little piece of paradise all to ourselves. Back to the boat and the sun shone through, warming us up after the storm. With the sun hanging low in the sky, we were ready for the last stop of the day, the most exciting of all. 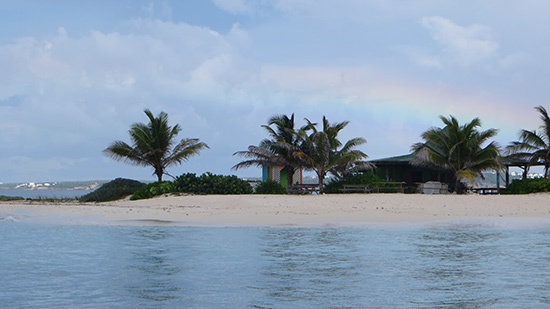 Little Bay bound, we said good-bye to Sandy Island. 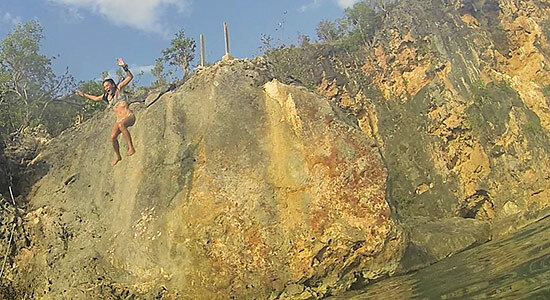 Pulling into Little Bay, there was just one thing left to do that day... jump off "the" rock. That's what we came for! Such an idyllic cove, it was so neat having it to ourselves that day, too. Our friends jumped into the sea and were the first ones to clamber up the massive boulder, sharp volcanic rock under foot. Once at the top, there were slight moments of hesitation. Then, they took the plunge! Once they were back in the sea, it was time for the girls to go. That rock can't be more than 15' high, but 15' sure looks tall when you're looking DOWN from it. Every time I climb up there I forget how scary it really is. Here's a little video to share the experience. You can hear me shout "J'ai peur" which is French for "I'm scared." Does my expression say "terrified?" We sat with Terrell and Wayne and just chewed the fat. 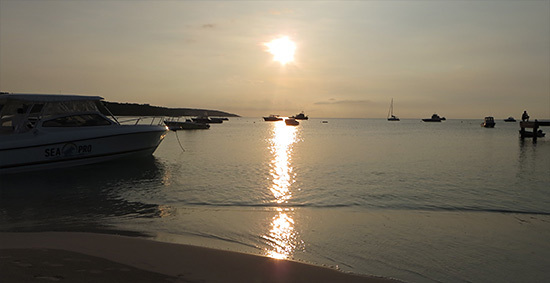 We talked about life in Anguilla, the things that make Anguilla oh so special, their experiences on the island. They are interesting guys. So generous with their time, they have huge hearts. With a little glass of wine for the cruise back, we all agreed that this had been one of those ultra special days. One for the books. The sea couldn't have looked more like a postcard on the ride back. The soft, afternoon sun illuminating the ocean, it was simply breathtaking. It's moments like these that make life so special. Living here in Anguilla is something else. 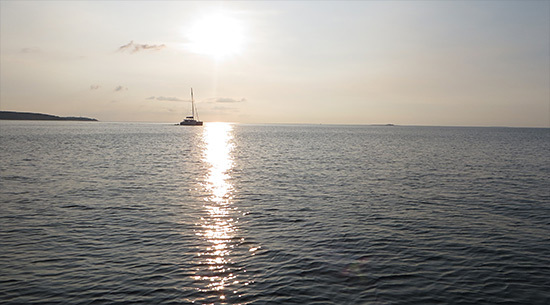 You never take it for granted, but you never appreciate it more than when you're out on the sea. Pulling back into Sandy Ground on Sunday and the vibe was cool and laid back. Locals were hanging out on the wharf, laughing, swimming, enjoying the relaxed nature of Sunday evenings. It made me think about Sea Pro's special offer. 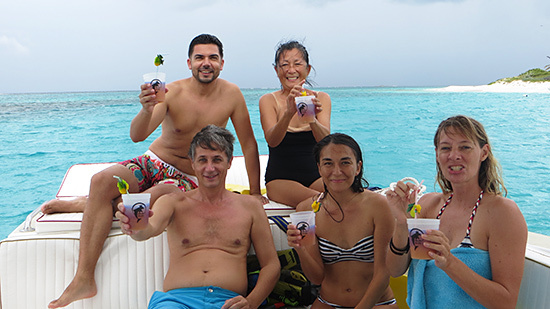 If you take 3 boat rides with them, they offer you a sunset cruise to Little Bay free of charge. Even though we had just gone out, I thought "I could go for that right about now!" We said good bye and good night, and took one last look at that piercing Sandy Ground sunset. It had been a perfect day, made all the more special by Wayne and Terrell. Terrell and Wayne, we will see you soon! 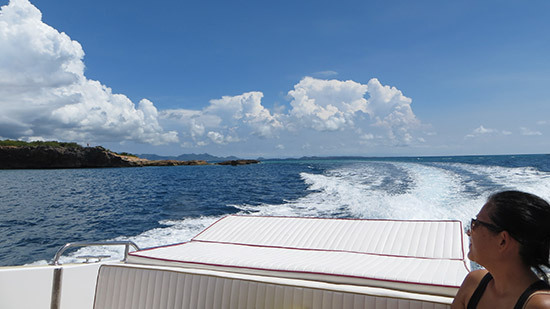 Sea Pro Charters offers some interesting boat activities. 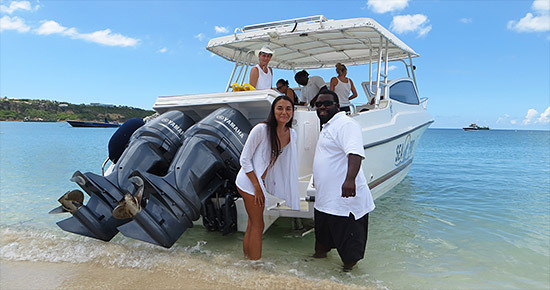 Whether you want to go to St. Barths for the day, organize an overnight trip to St. Maarten (they will help coordinate your hotel, restaurant and casino time if you would like), a fishing trip or a charter, they do it all. 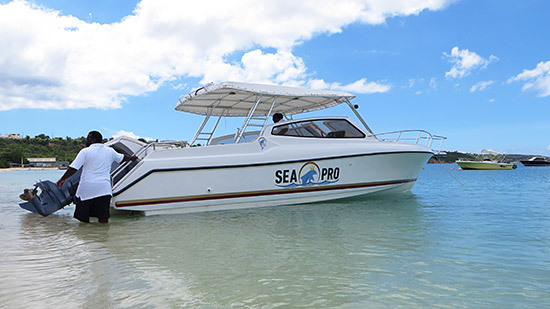 Tip: Book with Sea Pro Charters direct for the best price! Fee for canceling/rescheduling is $300 with 2 days allowed to cancel/reschedule. No shows are charged full amount. They accept cash, travelers checks, Visa, MasterCard, Discover, American Express.